Dementia Series 2 - Episode 2 - Dementia. A Social Disease. Who pays? Dementia Series 2 - Episode 6 - How simple are simple things? Dementia Series 2 - Episode 7 - My views - You’re with me or you’re not. TOP TIPS - Episode 1 - Top Tips - Having difficulty getting mum/dad/child dressed? Dear Christopher - Episode 1 - Full Post - Having difficulty getting mum/dad/child dressed? Dear Christopher - Episode 6 - Can we have direct contact with the carer? Behaviour - Episode 1 - Think Small! Focus on the smallest behaviours. Behaviour - Episode 2 - The 1 reasons why there’s behaviour. Dementia Live - (Series 2 Episode 7) - My Views - You're with me or you're not. In this week’s Dementia Live (Episode 7) I talk about my views. I believe the best way to deal with conditions; dementia or other conditions such as cancer is with positivity. Because I believe that if you take a negative view, with negative emotions, words etc then the follow up actions, emotions will also more likely be negative. I understand that living with a condition such as dementia can be difficult. I understand how tough it can be to have a family member living with a condition such as dementia and I understand how difficult this can be emotionally too. The guilt, the heartache, the frustration and anger. But I believe the best way to deal with this is through positivity. I also think that the negativity surrounding conditions like dementia can lead to people having a slightly warped and negative view of the condition. What does dementia look like? What does a person living with dementia look like? I think if you asked most people they would say perhaps, in bed, most of or all of the day. They can’t feed themselves, drink, move around or perhaps do anything. I meet people who are living with dementia and many, many of them are fully active, able to go out, go shopping, cook, take part in activities and live their lives for often many, many years. A person living with dementia can look a lot like any other person. Another reason why I believe positivity is the best way is that there are hundreds of different techniques, tips and tricks that can be used to make a small difference. I’ve given a fair few tips each week and I have hundreds more to come, with positivity we can use these small improvements to make little differences. It is possible to live well with dementia. Today’s top tip is about taking the fight to dementia and the language we use. Two weeks ago we shared some top tips on how to have a conversation with your parents about care. You can read or watch the video of that here. We are very good at taking the fight to cancer. We use empowering language such as ‘fighting against it’ and the like but not so much with dementia. Can we have direct contact with the carer? This is episode 6 of the Dear Christopher, series where we look at queries and questions from our clients and the questions and queries and conversations across Facebook over the last week. How does it work? Can we have direct contact with the carer? We allow direct contact between our carers and our families. It’s one of the ways that agencies fall down. The more lines of communication that are open the more likely is is that the communication will fall down. Carer phones the agency, agency staff asks a manager about the query, original member of staff calls carer back. Then that person calls the family and then calls the carer again… all for just one query! We also have an online care journal, so families can see what is going on with the care once the carer has completed the journal which is in near real time, works very well for families that don’t live so close to their loved ones. We work on a trusting, flexible basis and we find this results in a much higher level of care. You can call the carer and ask them to come in 10 minutes earlier or 15 minutes later one day. And most of the time I’m sure that’ll be no problem at all. It works best on a two way basis; if you are flexible with the carer then the carer will be more flexible with you. I know this way of working is not for everyone. If you’re looking for more rigid care schedule but with less consistent carers then drop as a message and I can put you in touch with an agency. If you’re looking for consistent care then fill in the form below, use the live chat below or give drop us a call on 02088860686 and we’ll see if you’re a good fit to work with us. Tagged: home care guide, dementia, How does it work?, Can we have direct contact with the carer? Last week we shared some top tips on how to have a conversation with your parents about care. A viewer commented on last week’s top tips with her own tip. She agreed that we could use her tip as this week’s bonus tip. 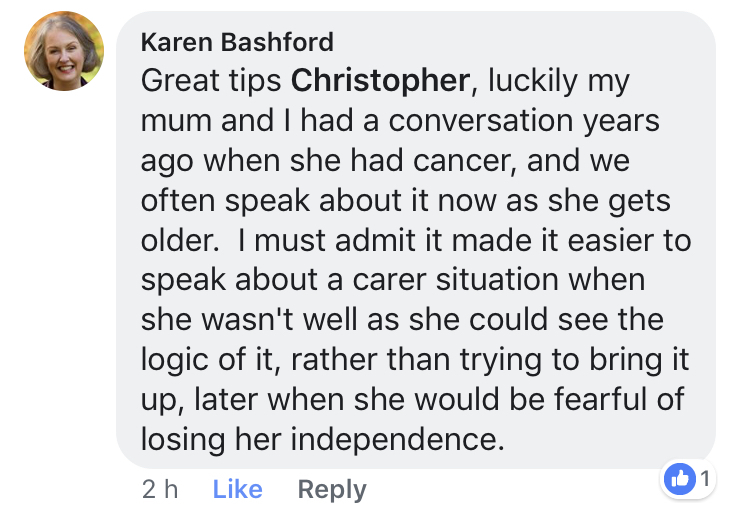 As you can see Karen recommends speaking to parents about care early, perhaps before the point where they lose their independence. This may make it easier for them to think they are in control and to agree some guidelines for when that time comes. Having the conversation about care when parents are at the point of losing independence can be more difficult. If you are at that stage and you need support with that. Do have a look at our tips, there are some conversation starters, there’s also the guide and we are also here to listen or to help on 02088860686 or at hello@carechooser.com. This is the Alzheimer's Society's tea activity from their Dementia Friends sessions of which I'm a trainer. Please do share the post. We’re going to have a quick think about how dementia can effect simple tasks and also how simple tasks are not quite as simple as we think there are. What about putting the milk back in the fridge, going to a chair to drink the tea, washing up the mug or putting it back in the right cupboard. How about the middle steps. Carrying the kettle to the sink, turning on the tap, filling it to halfway and many, many more. Everyday tasks are much more complex than we realise. Everyone has slightly different ways of making tea and people living with dementia will prefer their tea in a certain way too. Think back to the last week's fairy lights analogy (click here if you haven’t seen it) we talked about the fact that dementia can effect different functions of the brain not just memory. Movement, vision, coordination and more can be effected by dementia. What functions of the brain are required to make a cup of tea? Lots of functions are needed. • Movement – walking to the kitchen and picking up items. • Vision – seeing where items are. • Coordination – managing multiple steps to make tea. • Logic – measuring temperature or volume of water. • Sequencing – the order of steps to make tea. • Memory – where items are kept. If one of those functions was impaired, could we still make a nice cup of tea? Dementia is not just about losing your memory. Any of the functions we’ve identified could be affected by dementia. This means that people living with dementia may struggle with everyday tasks like making a cup of tea. Perhaps they may need support with part of the task that is difficult, for example pouring the kettle for them. Perhaps tea could be made together, following the instructions of the person. Perhaps the equipment and ingredients could be put together in a place that is easy to access and labelled. Retaining independence is possible. Supporting the person to make the tea will help them to continue to live well. People living with dementia may struggle with everyday tasks but with support it is possible forhem to continue to perform these tasks. This is the Alzheimer’s Society’s dementia fairy-light analogy. Imagine the brain is a string of fairy-lights. It’s not just memory that is affected by dementia. Depending on which fairy-light begins to flicker, dim and go out and which part of the brain is affected by the dementia. That will determine which function is affected. If the fairy-light at the front part of the brain starts to dim and flicker, and its this part of the brain that is affected by the dementia then it could be movement, concentration, memory, judgement, impulse control, consciousness or problem solving that become effected by the dementia. Now imagine instead that dementia affects the upper back part of the brain and a fairy-light begins to dim and flicker in this area then touch, temperature, pain regulation and spatial awareness could be effected which could cause a trip or a fall. Were a fairy-light at the bottom rear part of the brain flicker, and that part of the brain become affected by the dementia then vision will become difficult. Were dementia to affect the central part of the brain this could affect memory. There are two parts of this central area that are close together, the hippocampus which controls factual memories and the amygdala which controls emotional memories. The amygdala controlling emotional memories is much more resistant to dementia. It’s not just memory that is affected by dementia, it could be any one of the functions we’ve mentioned depending on which part of the brain is affected by the dementia. It is possible to live well with dementia with positivity and understanding. You may think you are alone but… I can tell you that you're not. Around 90-95% of our clients need to have the conversation with their parents because their parents are reluctant to have care or don't want care at all. Nearly everyone is in that situation. So... how to have the conversation. There's a full guide with conversation starters and tips from the GP on our team. Think about when the best time to have the conversation would be. During Coronation Street is probably not going to be a good time. Perhaps it be a good idea to have the conversation in a quiet room or a cafe. It's best to reassure your parents. There's some complex reasons why your parents probably don't want to have care. We talk about those on the guide, some interesting complex reasons. There's likely to be fears around losing independence and dignity and as well as some other complex reasons. Use empathy but most importantly of all. Listen and understand. If you listen and understand to what they're thinking and feeling they are much more likely to come round to your way of thinking. Avoid arguments at all costs. They just won't come round to your way of thinking if there is an argument. Think about how to start the conversation. The start of the conversation is very, very important. There are conversation starters which we've collated from lots of different websites on our guide. Could a GP be in on the conversation with you? Could you have the conversation in the GP's surgery. Perhaps a social worker could be with you or another professional. Is there a family member that could support you during the conversation? Have a think about support for yourself. It's probably going to take 3 or 4 conversations or more. Be patient and take your time. Perhaps allow your parents to meet the carer before starting the care. Some companies allow you to do that. And then perhaps also go 1 step further. Perhaps think about letting them meet the carer on their own or with you in a different room. They may feel like they are more in control and they can start to develop a relationship with that carer. Sometimes works very well. There's some extra bonus tips from our GP. Really interesting ones actually on the guide. Check that out at CareChooser.com It's at the bottom of the home page. See you tomorrow for Wednesday's Dementia Live video and article. This is episode 5 of the Dear Christopher, series where we look at queries and questions from our clients and the questions and queries and conversations across Facebook over the last week. A client and a carer asked a question or two about the Alzheimer’s Society Dementia Friends sessions over the last week. How do you become a Dementia Friend? You can watch the free videos on the Dementia Friends website or you can attend a Dementia Friends session. They are fantastic sessions, very positive, fantastic analogies that really help you to understand what dementia is and how it affects a person living with it. The sessions are 45 mins to an hour and are free. They are held across the country so search on the website and it will let you know if there is one coming up near you soon. What is expected of me as a Dementia Friend? The Alzheimer’s Society ask you to commit to just 1 dementia friendly action. That could be sharing a picture of yourself with your Dementia Friends badge on. It could be tell other people of the session. It could be to watch out to see if there’s someone that could use some help in the supermarket or perhaps your own idea. They also have a Dementia Champion session. Also free, it was around half a day when I did it. The Alzheimer’s Society trainers will train you to become a champion and deliver the Dementia Friends session yourself in your local community. If you know anyone who is looking for consistent home carer, let them know about us. I’ve talked before about the fact that dementia is more than just losing your memory. Depending on which part of the brain is affected by dementia that will determine which bodily function is affected by the dementia (memory is one of those). The upper front part of the brain is called the Frontal Lobe. This controls movement, concentration, memory, judgement, impulse control, consciousness and problem solving so if dementia effects this area of the brain these functions could be affected. The upper back part of the brain is called the Parietal Lobe. It controls touch, temperature regulation, pain and spatial awareness. If dementia were to affect this part of the brain then these functions could be affected. Difficulties with spatial awareness could result in falls or trips. The lower back part of the brain is called the Occipital Lobe which controls vision. The central part of the brain is called the Temporal Lobe. There are two areas close together called the Hippocampus and the Amygdale in the temporal lobe. The hippocampus controls factual memories, this area is particularly susceptible to dementia whilst the amygdala which controls emotional memories is much more resistant to dementia. So remember there is much more to dementia than memory loss. Depending on which part of the brain is affected will determine which function is affected. This is episode 4 of the Dear Christopher, series where we look at queries and questions from our clients and the questions and queries and conversations across Facebook over the last week. Memory loss is heavily associated with dementia. But there are many other symptoms and personality change is one. It’s also perhaps the most shocking and the most difficult to deal with. A person that has been quiet and reserved for most of their life can become loud and rude. Personality change is quite often one of the most early signs and often happens before diagnosis. There are over a 100 different types of dementia. Fronto-temporal dementia, a type of dementia that affects the front and side of the brain is heavily associated with a change in personality and behaviour and a loss of language. Very often the personality or behaviour change is to do with communication. The person living with dementia may be trying to communicate a need such as being too hot or too col, in pain, needing the toilet. There could be medication side effects or they could be lonely and isolated. Changes is personality could include agitation, repetitive behaviour, shouting, sleep disturbance, hiding things, hoarding, checking, losing inhibitions and more. Know that it could be communicating a need, see if you can work out what need it is. But you need to be very careful with the way that you deal with and respond to that need in relation to the change in personality and behaviour. If you respond to the need as a result of a behaviour directly it could cause the behaviour to increase long term. It is quite a shocking thing to deal with and it’s often very unexpected too. Dementia is a very inconsistent disease and different people may have different symptoms. The main message of this article and video today is to get across the fact that personality change can be a symptom of dementia. How do you talk to parents about care at home? Talking to parents about needing care at home can be a very difficult subject to broach. You're not alone. We've heard from lots of people who are at this stage. Tagged: Care, home care london, care funding guide, how to talk to parents about home care? This is the third in our new series on dementia. This week we’re looking at the positives of dementia and other conditions. I’ve shared some of my funny positive stories in the videos at the bottom of the page. How about we think and focus on all of the other labels the person living with dementia has; grandfather, grandmother, wife, husband, pilot, engineer, teacher. See life as a blessing and celebrate this time together. People living with dementia will forget factual memories. So they’ll forget trauma and loss. Perhaps this is a positive thing. Living with the fact yours spouse has died or other trauma is something you probably never get over. People living with dementia will forget this and return to the happy state of before the loss. It’s best practise not to remind them. Go along with it. It’s possible to live well with dementia (and for a long time). With consistency and structure it’s possible to live well. Make as much consistent as possible and set up structures and routines which can be learnt, a person living with dementia may be able to follow routines and gain independence. Focus on feelings and emotions that are recalled more easily than factual memories. Look out for feeling and emotions, smiles, a knowing glint in the eye. They know who you are emotionally even if they can’t remember exactly who you are or your name. People living with dementia can lose their inhibitions, they can be funny, brutally honest and forthright. Take it lightly and enjoy and laugh at these moments. I’ve also remembered this, perhaps I wasn’t impressed at the time as a young boy (!) but it’s a hilarious memory. Celebrate the unexpected moments. Celebrate the one time mum does remember your name even she forgot the last 8 times! People living with dementia forget factual memories, that means they’ll forget good news. I read on Twitter that a lady went to see her mother who was living with dementia. She told her the good news that she was pregnant. She was delighted, over the moon. The next time she went to visit, she was delighted again! It was a great surprise! Every time the lady went to visit her mother became a celebration of the pregnancy long after others started to tire of the news! I’d love to know if you have any other ideas of the positives of dementia. Send us a quick message of any funny stories you have to hello@carechooser.com we’d love to hear them. Let’s look back at last week’s behaviour article… I suggested you focus on the smallest behaviours rather than the large behaviours such as screaming or aggression. 1st of all it’s easier to make a difference with small behaviours. 2nd if you focus on the large behaviours. You’re sending out a message even if you don’t know it is that anything lower than this is acceptable. If you focus on the smallest of behaviours, what you are secretly saying is that anything bigger than that is unacceptable. And so in doing so you deal with the large behaviours anyway! This week… the 1 reasons there’s behaviour (there’s just one). It all comes down to ‘it works’. The only reason there is behaviour is because it works. Whether it’s screaming, defiance, aggression, being nasty, sibling rivalry. It all comes down to the fact that it works. If you can work out how it’s working. It becomes quite easy to stop. I’m doing some coaching on behaviour and taking on just a few clients each month. Get in touch and we’ll see if you’re a good fit to work with me either with the elderly with dementia or with children. Share this with someone who needs to see it and watch out for the next live video and article. Have a great week. Think Small. Focus on the smallest behaviour. Behaviour is my passion. But it wasn’t always that way. I was terrible managing behaviour. I learn some secrets and now through my company CareChooser my carers use my techniques to work with people living with dementia. Most experts will focus on the ‘big’ behaviours. The kicking, screaming and the spiteful behaviour. You know what. That’s not going to work. I focus on the smallest behaviours, the smallest behaviours you can find and identify. It’s easy, its’ easy to make a change here and you’ll find they start to filter up to the big behaviours anyway. If you want to know more about that. Come inside and read my story. Dementia. A Social Disease - Who Pays? Dementia - Series 2 - Episode 2. This is the second in our new series on dementia. We’re continuing this week’s theme of funding. There are 2 types/strands of funding; social care (council) funding, you pay for unless you’re eligible for home care funding and NHS healthcare funding, free. Dementia is classed as a ‘social disease’. It usually falls under social care. Personal care and activities of daily living such as cooking, dressing, washing, housekeeping all fall under social care funding with your local council. You’ll have to pay for this privately unless you are means tested as eligible. The current threshold is £23,500 in cash or investments (not including your home for home care). Your home is also taken into consideration for care in a care home. NHS support is free in the UK but for ‘complex’ health needs. A diagnosis of dementia does not qualify you for home care funding under the NHS. It depends on the severity of ‘health’ or ‘medical’ needs. Physio, eye sight, hearing, footcare, speech and language, mental health. Mobility, terminal illness, rapid deteriorating health, long-term conditions, physical or mental disdability. Breathing, continence, communication, skin wounds, cognition. Request an assessment from your local commissioning group (CCG). It’s health care funding so you can request this via your GP or social worker. Most people talk about what their loved one can’t do. Cooking food, dressing, washing etc. This falls under social care. You need to think about health care needs. Check out Care To Be Different. A website that provides support in gaining NHS funding.